In 1881 Othniel Marsh noticed that there existed a small reptile skeleton within the Compsognathus skeleton. He concluded that it was possibly a foetus, or alternatively that Compsognathus had swallowed one of its own young. In 1903 Barin Nopcsa dismissed it as an embryo and concluded that it was a small lizard - the dinosaurs last meal. 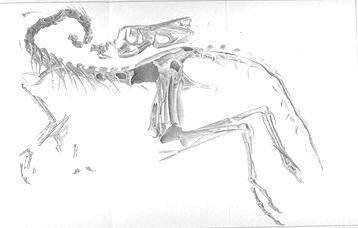 This discovery, together with the discovery of Archaeopteryx, would lead to the T. H. Huxley school of thought that birds and dinosaurs were closely related.